Dr. Rohit Parthi, M.B.B.S, M.D. (Medicine) ,D.M. 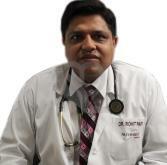 (Cardiology) is a consultant Cardiologist at Alchemist Hospital, Panchkula. Prior to that, he has career stints as a consultant cardiologist at Mukat Hospital, Chandigarh and Assistant cardiologist at Fortsi Hospital, Mohali. Apart from this he was associated with Prime Heart and Vascular Institute, Chandigarh for a tenure of one year. Since last two and a half year he has been associated with Alchemist Hospital, Panchkula. Dr. Parthi is an alumnus of the prestigious institute GMCH- 32, Chandigarh where he completed his M.B.B.S. Followed by Post graduation in Medicine at Chandigarh Medical College, Ludhiana. Thereafter, he accomplished his superspecialisation in Cardiology from the same institute. To his credits, he is performing an average of 125 angiograms in a month out of which 60- 70 angioplasties and 20-25 open heart surgeries are performed. Dr. Parthi is an active member of various professional associations and he actively participates in various conferences & workshops to increase his skills and knowledge. He believes in and treated ethical cardiology .